...Can you identify these photos? We often receive mystery photos or memorabilia relating to Memphis and are asked if we can identify the photo or the source. We need your help with this and have added this page for our viewers input. If you have any information or any ideas about any photo or memorabilia on this page, please contact Gene Gill. If you have any vintage photos taken in the Memphis area and you need help in identifying the subject, send them to us and we'll post them on this page. Please scan the photos as large as possible, and include any known information about the photo. July 7, 2018: Anonymous writes: "...Could you post this image of an oil painting I own? I am trying to discover the identity of the female sitter. 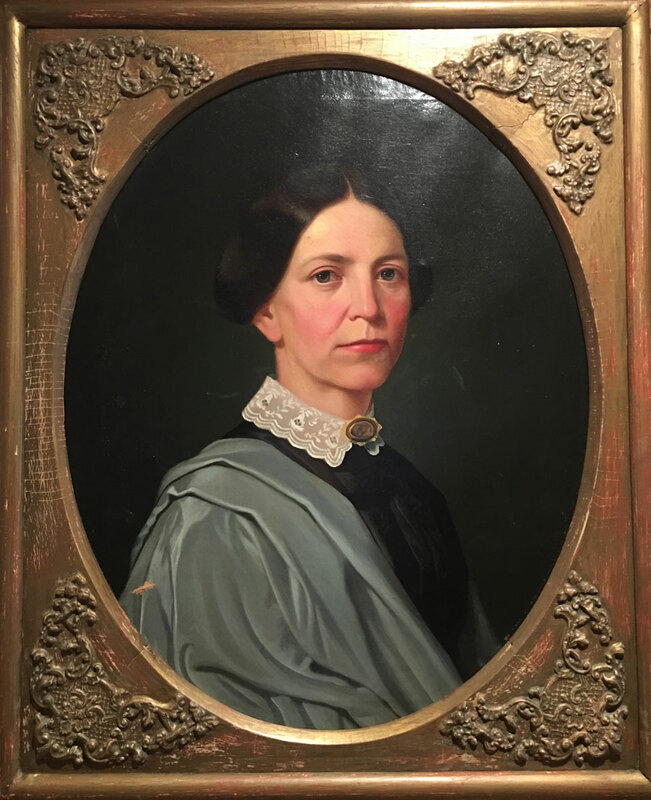 I bought the painting at the Cronk family estate sale in Memphis and have inquired many times through the estate company, to no avail, as to who this lady may be. The reverse is signed by J.W.B. Garrett and dated 1853. Mr. Garrett was a period portrait artist during the 1850’s in Memphis. Can anyone help identify the woman in the portrait?" 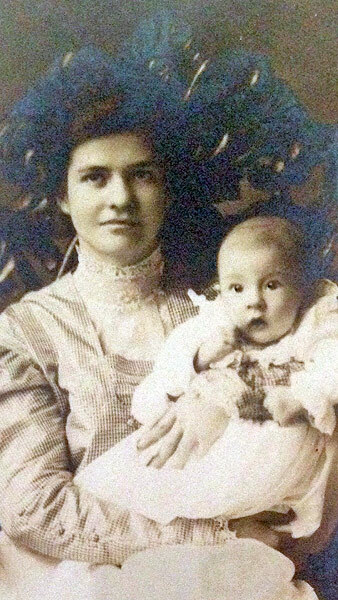 December 3, 2014: Penne Wilson writes: "I found this photo that my mother had in the attic. She might have purchased it in an antique shop at some time. On the back of the frame it has Wheaton's Fine Art Store on Monroe Ave, Memphis (Sticker). Can you help identify the woman?" Additional Information: Penne's mother does not remember purchasing this photo. Her house in DeSoto County, Mississippi, where the photo was found in the attic, was built in 1978. 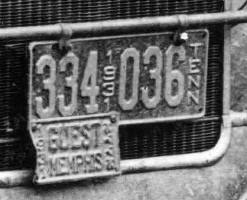 We do know that Wheaton's Framers was a well-known Memphis company dating from 1905 up to 1930. However they only used the name "Wheaton's Fine Art Store" (the sticker on the back) from 1925 to 1930. That determines when the framing of the photo was done, but not the actual age of the photo. The lady's style appears to be older than these dates. 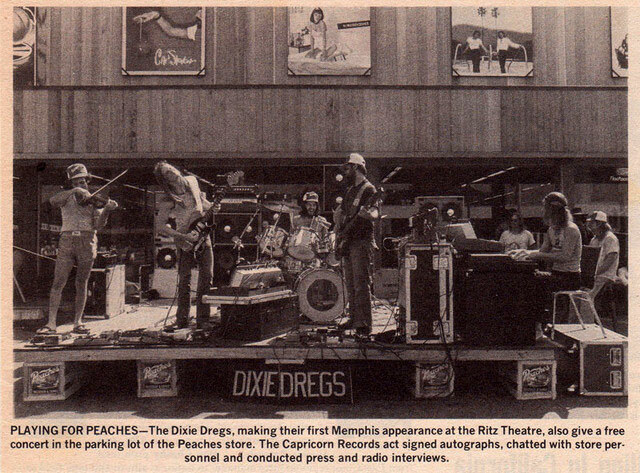 December 3, 2014: Marije Essink of the Netherlands writes: "I have been trying to find more information about an event that took place in Memphis in the Summer of 1977 - the band Dixie Dregs playing at The Ritz Theatre and also doing an outdoor performance in the parking lot of Peaches Records, probably on the same day. It is mentioned in an article from Billboard Magazine. I am trying to find out the actual date for these performances, so far without any luck. I realize it's long ago, and is a stretch to find out, but I'm hoping someone might be able to help me? Maybe you have an idea for further lines of research?" Addition Information: Even though this photo is dated circa 1977, the Memphis Ritz Theatre closed in 1967 and became The Guild (Circuit Playhouse). In the list of touring dates by the Dixie Dregs, their only listed Memphis date is 1979. March 12, 2014: This "token" was purchased on Ebay. It's the size of a dime. We think it could be a commemorative surveyor's marker? The date is obviously important, as are the letters in the center. We've gone through Equitable Building, Elks Building, Exchange Building, and the closest we can come to anything happening on that date is the opening of the Memphis Zoo. Anybody know what it is? Or Anybody have any ideas? Where is this building ????? February 8, 2014: Steve purchased this old photo at a Memphis estate sale. On the back was a sticker that it had been framed by "Wheaton Fine Art Shop, 122 Monroe". He has no other information other than thinking it was a Memphis factory in the background. He's asked for our help in identifying the location or in dating the photo. 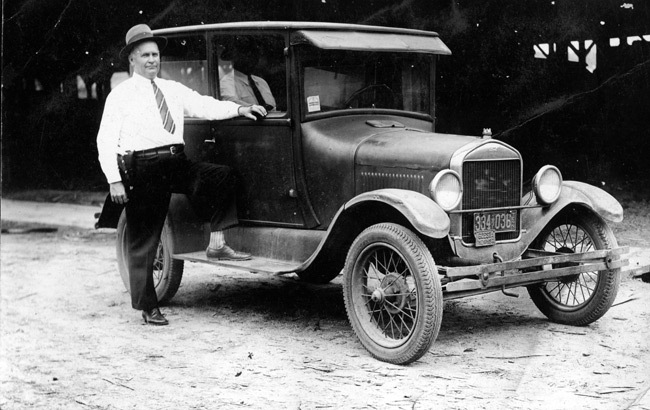 From old directories, we know that Wheaton's Framers were located at 122 Monroe as early as 1905 up to 1930, but their name was "Wheaton Fine Art Shop" from only 1925 to 1930 - so that, and the autos in the background help date the photo. Pictured is a group of men - all of them from middle age to old age and they're all wearing overcoats - so it's winter. There are no noticeable trees or grass and the landscape is flat which tends to eliminate Memphis as a location. The building is definitely not traditional "Southern architecture". It also appears to be a converted barn because there are "hay loft" openings on all levels. 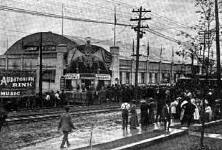 One of our team members thinks it could be "...something like a Dairy or Cattle Convention at one of the Fairgrounds early buildings". Another thinks the landscape looks more like "...Kansas, than Memphis". What do you think? Can you identify the building, the location, or provide additional information? 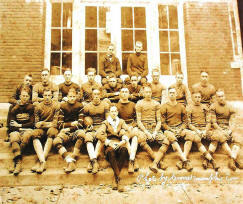 February 19, 2013: Memphian Mary Mount Curry came across this photo in files of a deceased relative. She hopes someone can identify the man and/or provide information about the "Guest" 1931 license plate. The man has a gun on his side. Can anyone identify or provide any information? Can you identify this man...circa 1931 ...???? 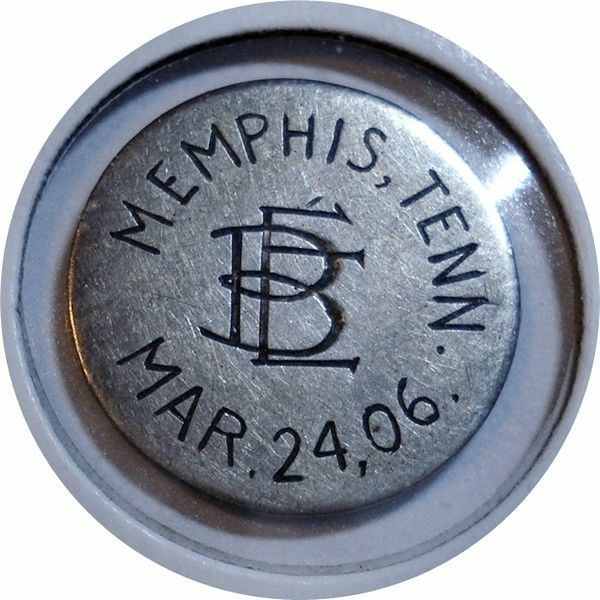 February 20, 2013: Email from Joe Sharp: " Guest tags were for car owners who lived outside the city limits and used the Memphis city streets infrequently or often. The tag was to be mounted to the front license plate. The cost was 25 cents. " . Another "revenue generator" for Memphis". 6. MYSTERY SOLVED! Thank you Phoebe. This photo of "Bryant's Place ...For Colored" has been in our files for a long time. 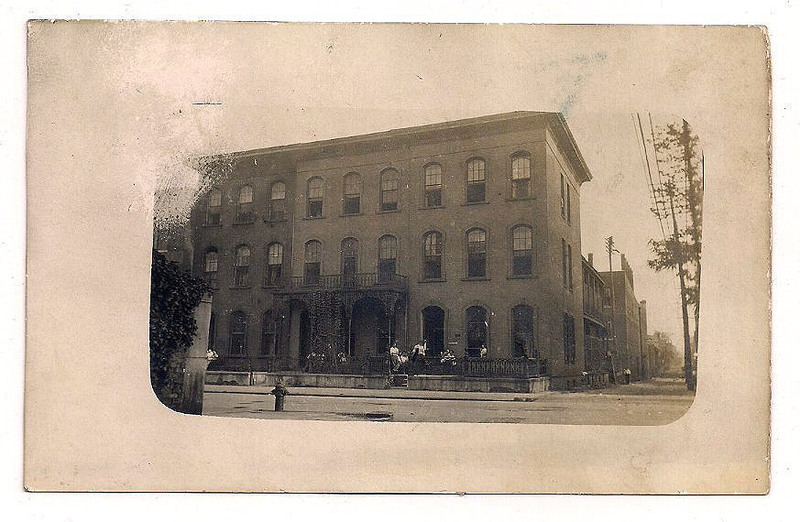 We've tried, without success to find the address of the building and an approximate date. Can anyone identify this restaurant and the location, or provide additional information? February 25, 2013: Email from Phoebe Moore: " ...Photographer was Dorothea Lange ... taken in 1937. 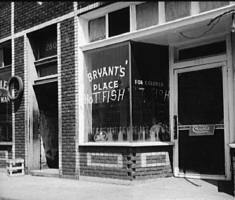 According to the 1937 City Directory there was a restaurant/lunch room owned by Thomas M. Bryant at 282 S. 3rd." 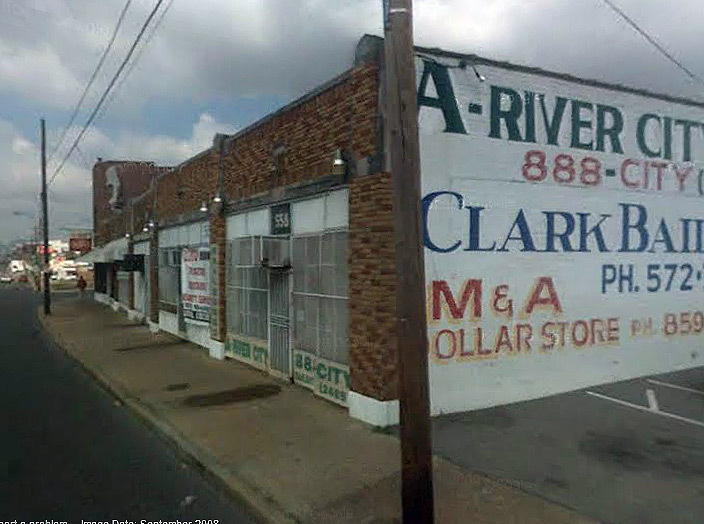 January 6, 2013: Email from Jim Spake: " ... Hunches ... sScreams Beale St. to me… the address lines up… north side of the street. This photo was taken in 1907 of the Auditorium Rink (skating) at 1552 Madison. Can anyone provide any additional information about this skating rink or photos? This photo of a busy A & P Store has been one of our mystery photos for sometime. We think it's in the Cooper Young area but need your help. Can anyone identify this A & P Store, the location, approximate year or provide additional information? A and P Store ????? This postcard, identified as a "Memphis Tennessee Hotel" was mailed from Memphis to Kalamazoo, Michigan in 1910. Based on the Memphis Directories of this period, we have eliminated most of the hotels listed. A "possible" contender is the ZANONE WAYSIDE INN on Thomas and NW corner of Plum. Can anyone identify this hotel , the location, or provide additional information? 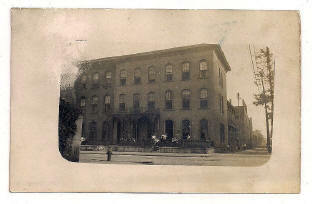 Memphis Hotel - Circa 1910??? Can anyone identify the person or the location? 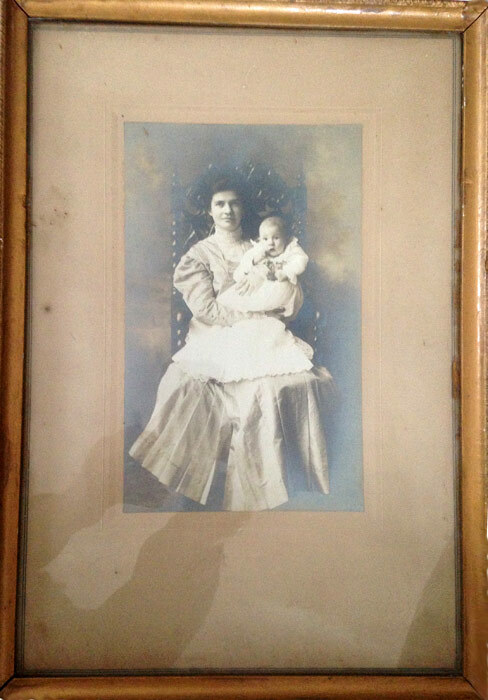 October 15, 2012: Diann McBee of North Carolina (formerly of Memphis) found this photo in her Memphis Grandmother's possessions and is intrigued by it. On the back a handwritten notation says "Tex Hill". She has contacted Tex Hill, the actor-singing cowboy, and he says it is not a picture of him. Diann's grandparents were Fred and Lee (Minor) Burchette, and they lived mostly in the Hollywood area - Doris Avenue (1937), Gaither Parkway (1938), Person (1939), Bristol (1940). 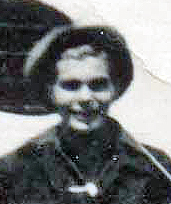 There is also a possibility that the photo could have belonged to her aunt, Clyma Glenn Burchette or be associated with DeSoto County's "Hernando's Hideaway". Can anyone identify the person or the location? The Goldcrest Beer sign appears to be especially chosen as a background for the photo. It is newly painted by sign painter Jim Scott, probably to announce the "new" Goldcrest 51". Goldcrest Beer was brewed by Memphis' Tennessee Brewery and became Goldcrest 51 in 1938 to honor 51 years in the business. Based on the size of the bricks on the background building, the person in the photo appears to be about 6' 3" tall. October 17, 2012: We have now eliminated another "Tex Hill" - the prominent flying Ace of WWII. His daughter has confirmed that the photo is not a picture of her father. January 21,, 2014: Email from Jim King: "... It's been awhile, but I see nobody has solved the mystery picture identity of the young man in front of the Goldcrest 51 sign. I love a mystery and little by little have chipped away at this one. Still don't have a definitive answer, but take a look at one of ... the old Tech High classmates and tell me what you think. The fellow in question is Lloyd Arnold McCullough. 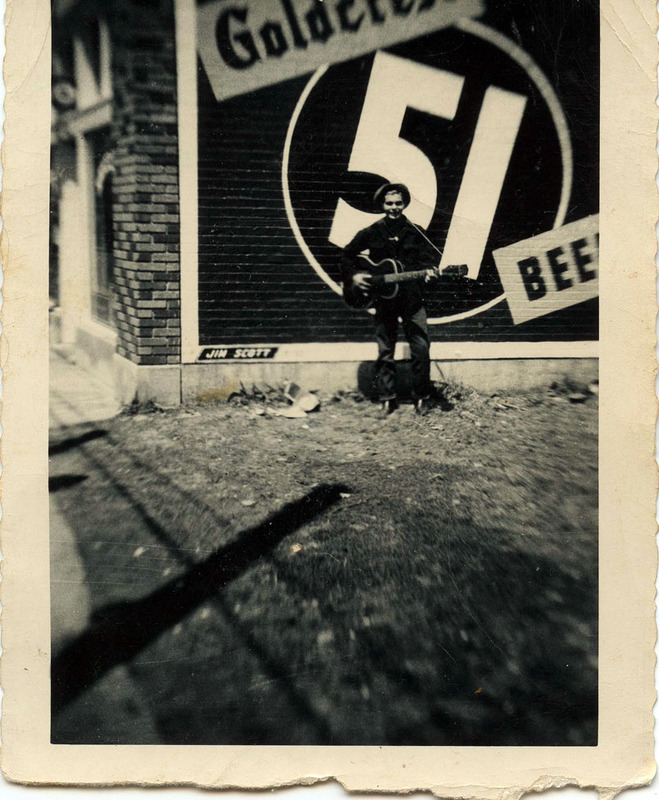 About the time the mystery pix was taken, he was an aspiring local musician, and the location of the sign on Poplar Avenue is in the Tech High neighborhood. There is a strong resemblance, yes???? Maybe this will trigger some other people's memories which are better than mine. He went on in the 50's to establish a somewhat successful musical career as Lloyd Arnold, moving from country into rockabilly and rock and roll music venues". ...Died 1976. "...Another bit of trivia about Mr. Scott - he had a wooden leg. People would gather to watch him paint his signs both for his artistry as well as his characteristic "high-wire maneuvers" climbing up and down ladders and negotiating scaffolding. It got a bit scary sometimes - he worked without a net!" 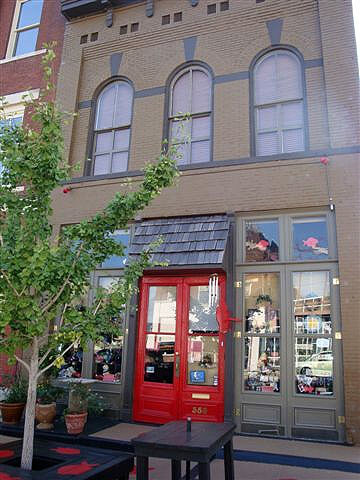 January 6, 2013: Email from Jim Spake: " ... Hunches... Sure looks like 356 Main Street to me. I lived there in the early 80s, and it became "Jakes Place" later. Again, just a hunch, but the windows and the light look just like what's still there. December 30, 2012: Email from Jim King: "This picture, I believe, is located in the 300-400 block of Poplar Avenue. Jim Scott was a personal friend of my father and painted many billboard type signs around Memphis during the 1940's and 1950's. I was a kid of about eight or nine-years-old then, but I distinctly remember Jim painting this sign. He also painted signs for my father's service station on the corner of Poplar and High where Carroll Street intersects (only the foundation remains today). This picture appears to be from about 1950 or 1951 and is located on the side of what was then Curl's Cafe. 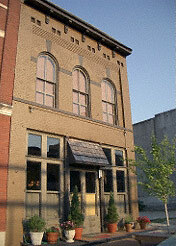 The building still stands and is today what we call a strip center located on the North side of Poplar at High Street extending East on Popular . The strip at that time included Moss Drug Store (now a bail's bond business), Sampietro's Grocery, Thompson's Barber Shop (before Babe and Mace Thompson moved into a new building two lots farther East on Poplar), and Curl's Cafe. Across the street on the Southwest corner of Poplar Avenue and High Street today is the Memphis (Jimmy Stroud) Mission (former location of my grandmother's home)." "I recognize the man in the picture, but unfortunately do not know his name. I was too young to remember at the time, I guess. 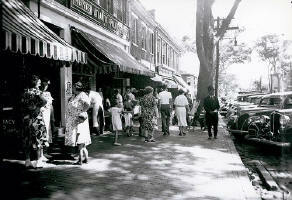 In the 40's and 50's that neighborhood was quite lively, but most of the people of that era have since passed on. " All we know about this photo is that it was taken in 1900 by the famous Memphis photographer, Covert. There have been some "thoughts" that it could be University School or Messick School? 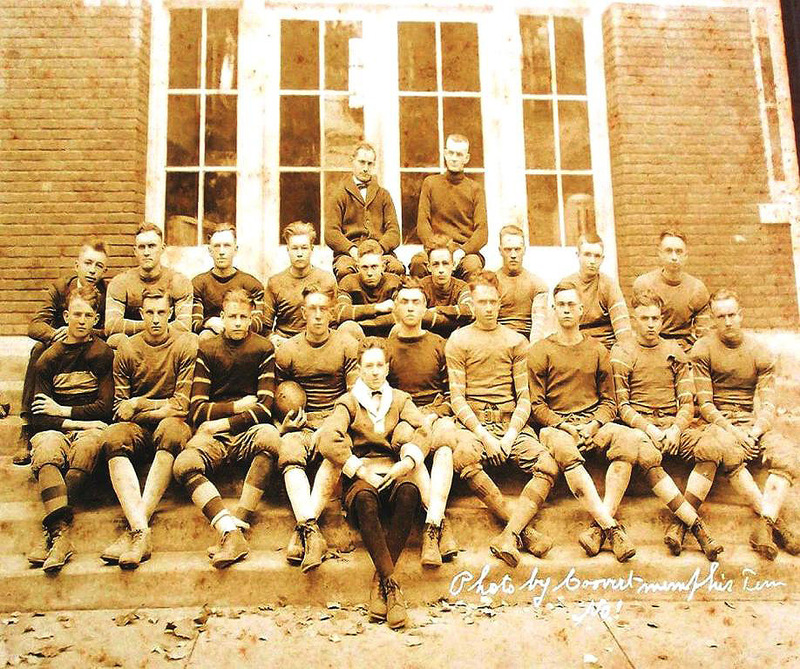 Can anyone identify the football team, the building, or any of the players?